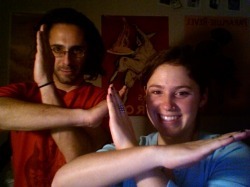 and "The Sign of the Four!" Each summer we bring a bunch of young actors together in the Northeast Kingdom of the gorgeous Green Mountain State, and beyond. We train for just two weeks, creating an intentional-community-of-the-arts in the process, and then we put on a production or two that we'd be proud to show to anyone in the world. How we do it: We get physical! With great warm-ups, voice training, and specific techniques passed on to us by amazing teachers, like Jacques LeCoq, Tony Montanaro, Sigfrido Aguilar, Avner the Eccentric, and Gould & Stearns. 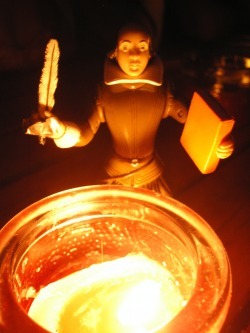 With our physicality, we cause Shakespeare's language to leap right off the page. With our should-be-patented "Vector Training," we GET Shakespeare in a way that young people will never forget. Why we do it: We think that the Funnery theatre training is so positive, it is the antidote to everything negative, cynical, condescending, threatening, or commercial that could possibly colonize young bodies and brains. We call our camp “Two Weeks to a More Powerful You!” We do wish that we could have these young people for the other fifty weeks of the year. It's a diagram in space, of the four main elements of our daily teaching: Heart, Mind, Body, and Voice. Travel the country; see anyone wearing a "Get Thee to the Funnery" T-shirt. Make the sign of the four; it'll come right back at you. HEART: We work every day on empathy: for each other, for the material, for our audience, & for Shakespeare himself. MIND: We help each other to understand every word, joke, context, motivation, character, in the entire text. We study meditation, too. ​VOICE: We do deep breathing, learn about resonance and articulation, and we sing; we care enough about our audience that we want everyone to hear and understand! We discover what may be in the way of a free and natural voice, and we work to get whatever it is out of the way! You may hear about the "Sign of the Four" somewhere else, but remember: it all began at the Funnery! We think that the best learning happens collaboratively. All our daily activities happen in a big sprawling happy ensemble. And then we cast the play! We have no stars; we share roles. In 2005, six different people played King Lear. Five of them were girls. Sometimes our urge to multiply or divide a role brings unexpected dividends, as when we discovered that Trinculo in the Tempest could be a bad ventriloquist! ("Can he vent Trinculos?") Thus two people could share his lines at the same time, and Ariel, tricksy spirit, could tease both the man and his dummy. We perform outside in a lovely formal garden at Sterling College, with the hills and mountains of Vermont as our backdrop. Costumes and props are minimal. We're all on stage all of the time, watching the action, adding voices, acting responsible for the whole play, not just the several scenes we're in. Our campers come back for more every summer, so they'll have a chance to play young, old, male, female, comic, tragic, noble and lowly, by the time they're just too old to do camp any more. And then, if they're lucky, and we're lucky, too, they may join our staff!